Follow steps 1 to 6 from Adding an Excel file filter. Select Simple Wizard and click Next. The content in the Preview page is selected for translation. The Preview page models an Excel file. select the number of rows to show on the preview page. use the column headers of the Excel sheet. If not selected, the column letter (A,B, C) appears in the next step. select the first row for translation. Rows above the selected row will not be translated. The Selection page appears. If you have selected the Use header checkbox, the Excel sheet headers appear as column names, in the Column Name column. 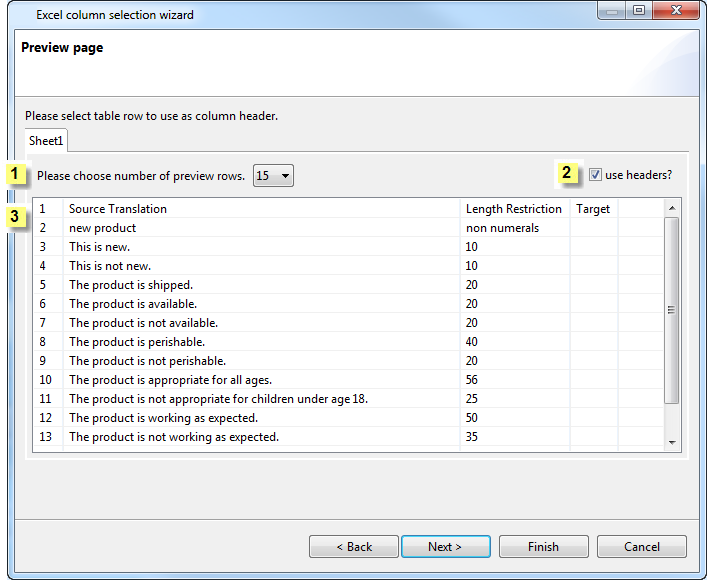 In the example below, the Excel sheet headers are Source Translation, Length Restriction, and Target. An example of the source Excel spreadsheet appears below. 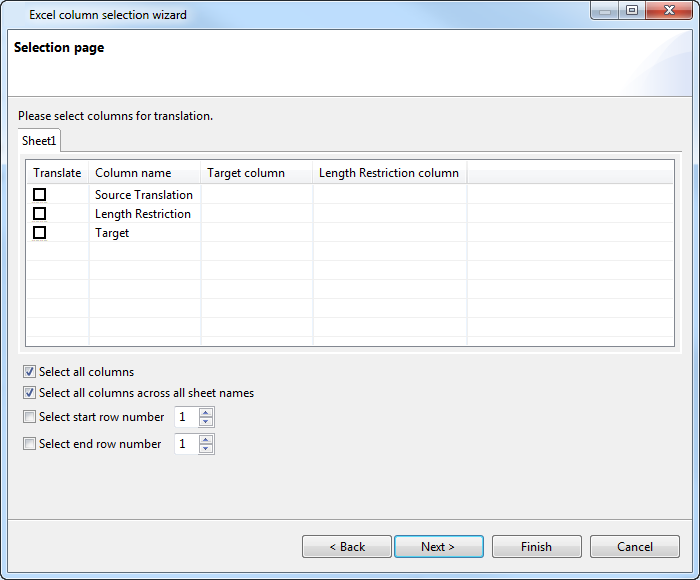 In the Translate column on the Selection page, select the columns for translation. Select the starting row number. The content extract begins with this row number, and ends at the selected end row number. Select the end row number. The content extract ends with this row number, having begun at the selected end row number. The corresponding Column name appears in the Target column as shown in the example. The Regular expression page appears. 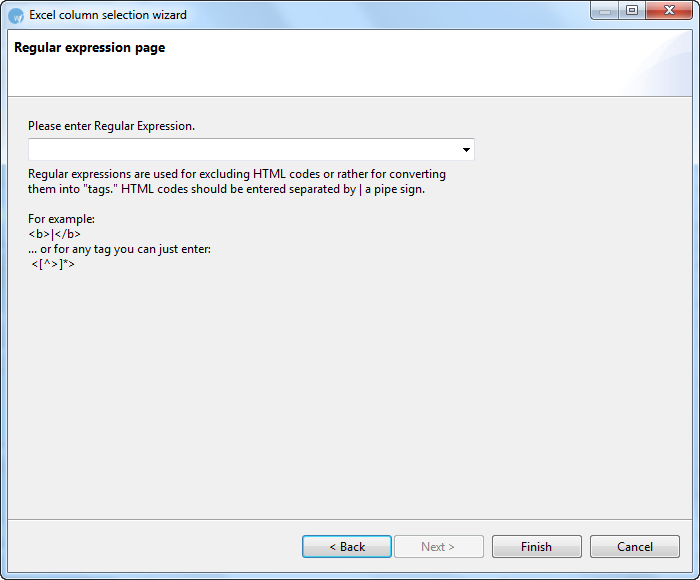 Enter a Regular Expression for the Excel analysis. Note: A regular expression provides a pattern to mark up any embedded HTML tags or variables in a column as tags. 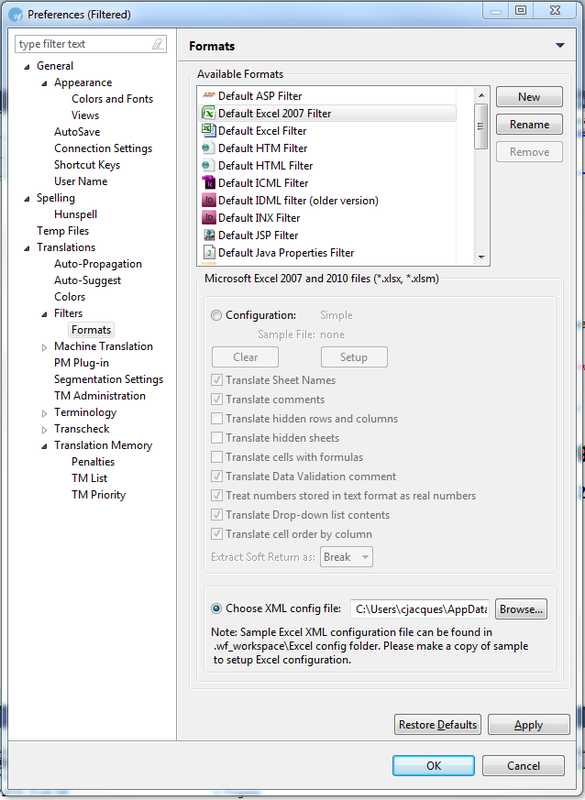 The configuration and sample file path appears in the Formats Options box as shown in the example below. 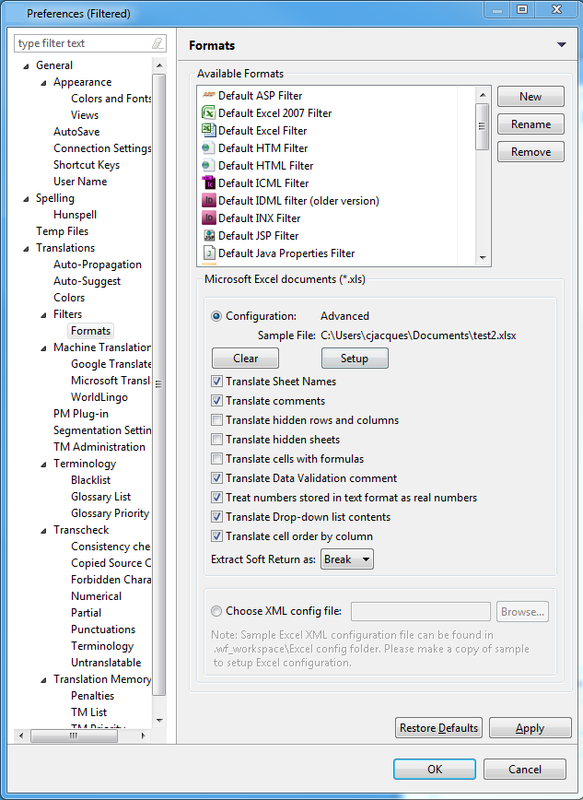 Select the Translate Sheet Names checkbox to include sheet names as translatable text. Selected by default. Select Translate Comments to clear it, and not include comments as translatable text. Selected by default. Select the Translate hidden rows and columns checkbox to include rows and columns hidden in the Excel file as translatable text. Select Translate hidden sheets to include hidden Excel sheets. Select the Translate cell with formulas checkbox to include cells with notes and formulas as translatable text. Select Translate Data Validation comment to clear it, and not include columns in the Excel sheet used to record comments validating the data, for example, columns recording vaccination data by date applied and dosage. Selected by default. Select the Treat numbers stored in text format as real numbers checkbox to include numbers as translatable text. Selected by default. 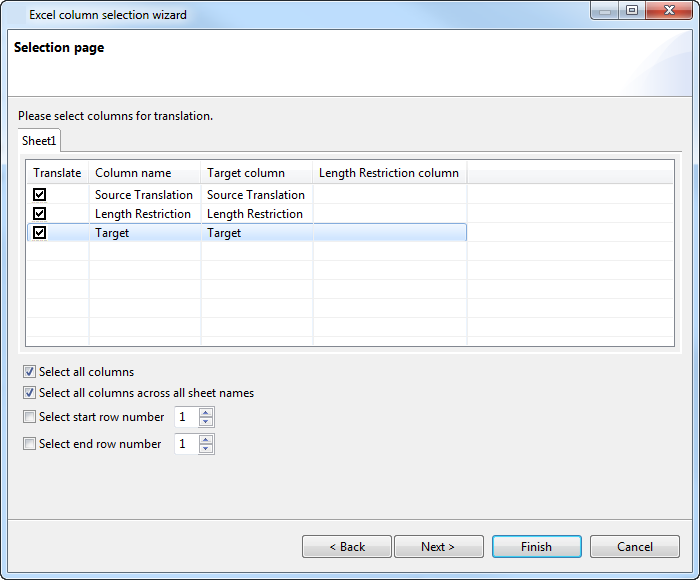 Select Translate Drop-down list contents to include the drop-down list contents in the translation. Selected by default. Select Translate cell order by column to extract cells by columns, instead of by rows. Selected by default. Select the preferred option for Extract Soft Return as: Break or Tag. Select Choose XML config file to format the filter using an XML file. Note: Selecting this option disables the options immediately before. The XML file overrides the Excel Column Selection Wizard, if it has already been set up. Copy the sample excelConfig file to your preferred folder. Open the copy of the sample excelConfig file in your preferred text or XML editor. Edit the copied sample excelConfig file to set up the filter configuration. The file acts as a template for your preferred filter setup. Note: Remove or comment out any fields in XML that you are not using. Select the path to the edited excelConfig file. An example is shown below. An Excel file filter is set up. Note: You can now directly open Excel files using this filter. While opening files you must choose the correct filter, when prompted. You can also rename the filter using the Rename button.